Weddings are special and will always be special regardless of how simple or lavishing they are. It is the moment that every couple have been longing for, to become united as husband and wife. Weddings are and should be memorable not only for the married couple, but also for the guests who witness this epic moment. It is at this time when the couple can finally say that their souls have been tied together as one. You can also see sample ticket invitations. 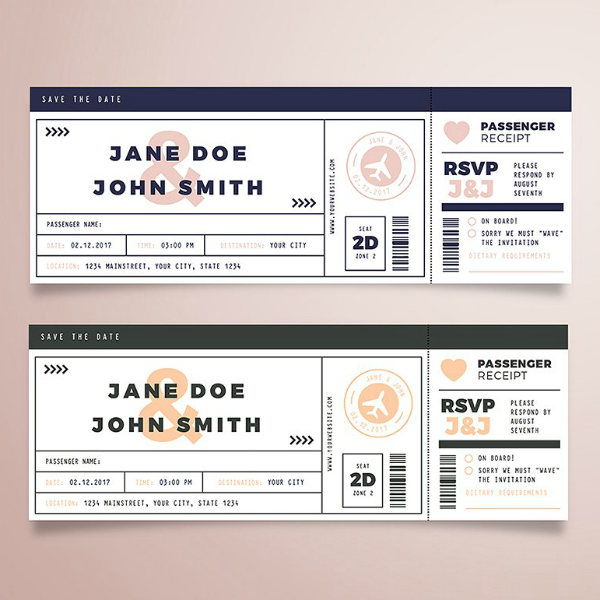 Here, we have a collection of invitation designs and templates that come in the form of boarding passes, which is a rather creative way of doing it. 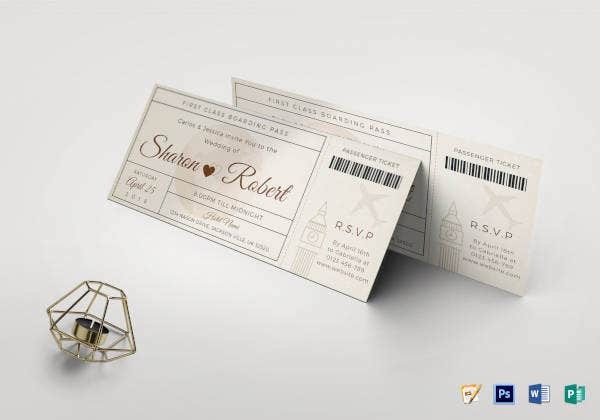 Boarding passes are the documents issued to a passenger to allow them to board an airline, and here, the boarding pass-inspired invitations are intended for allowing the guest to enter the wedding venue. 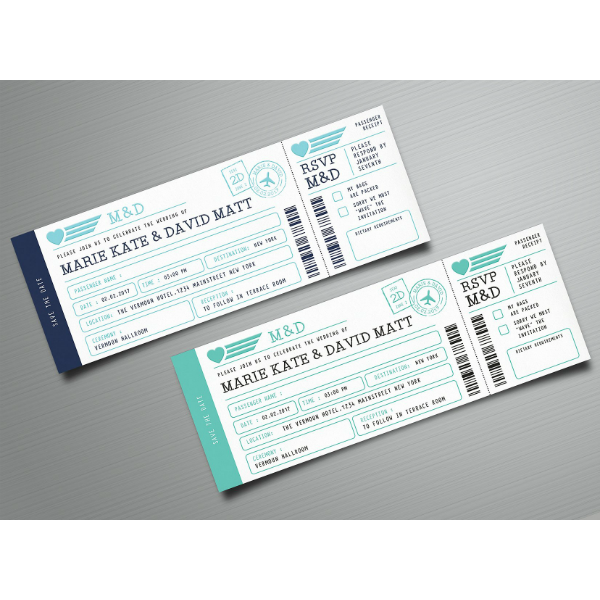 Whether your wedding is airline-themed or you simply enjoy the look of having your wedding invitations resemble boarding passes, the templates below are indeed the perfect ones for you. 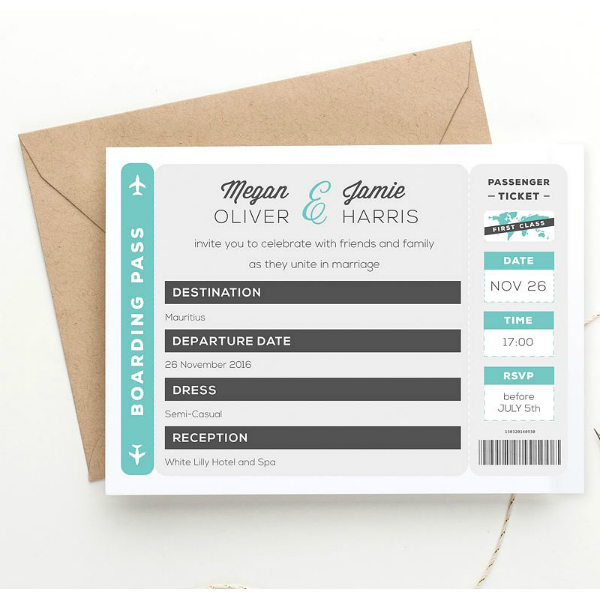 Along the way, you will also learn things about boarding passes as well as how to plan weddings, so be sure to take note of those while scrolling down to see the templates. 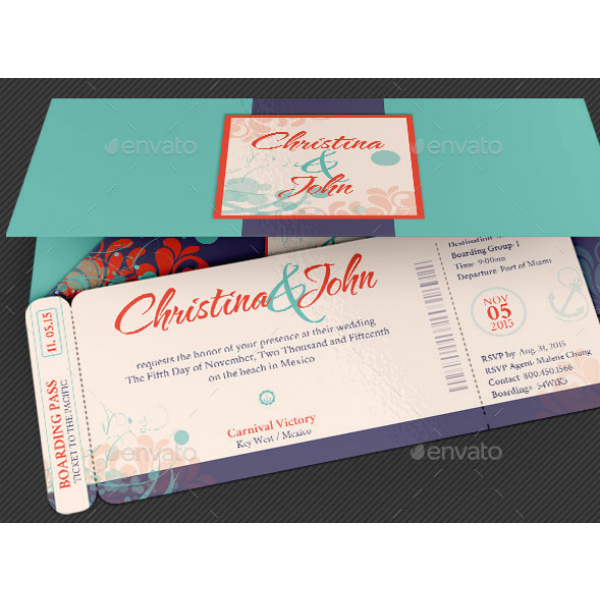 The theme of your invitation card should match the motif of your wedding ceremony. 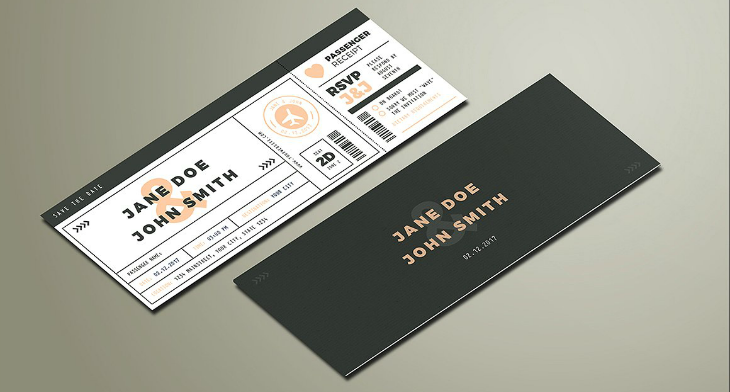 Make sure that the text on the invitation are clear and legible enough, make the text contrast with the background color, avoid light-colored ink for bright backgrounds and vice versa. 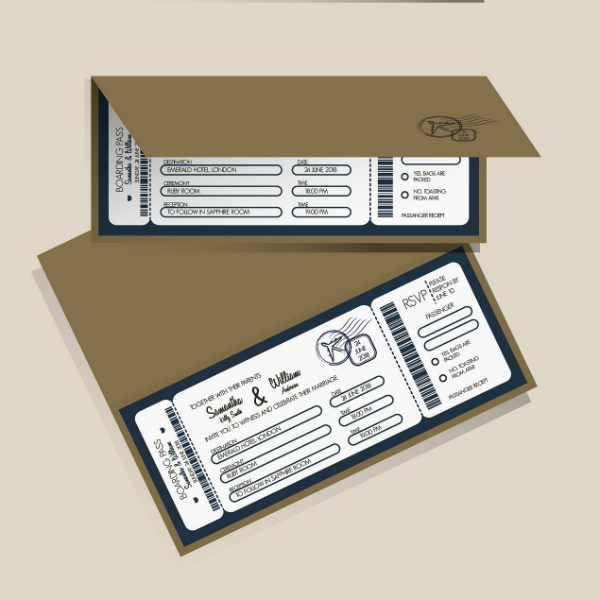 You may also see ticket invitation templates. 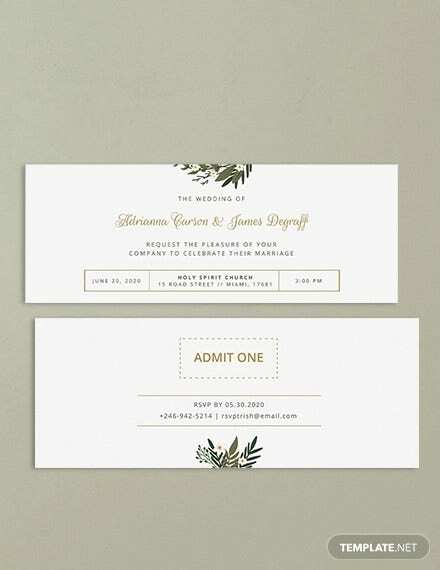 Keep the invitation design simple and clean, don’t cram it up with too many elements. 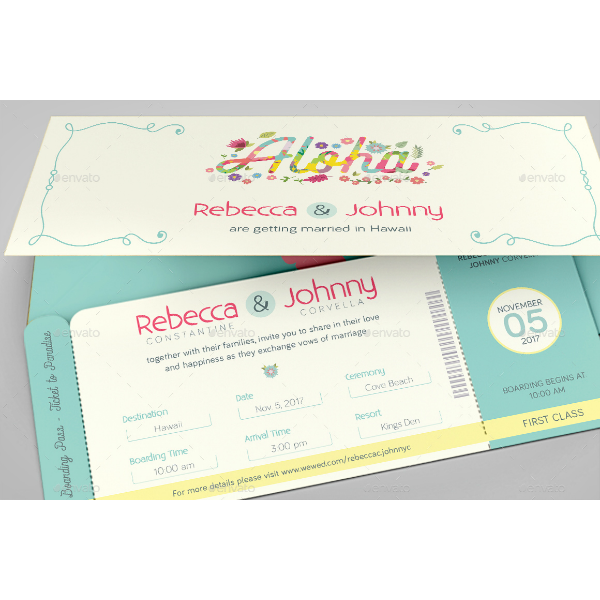 Send out your invitations between ten to twelve weeks before the wedding date. If you are using save-the-date cards, send them out as six months prior to the wedding date to let the invitee set their schedule or “save the date”. Always proofread before sending out your invitations, make sure that every information is correct to avoid creating confusion on the part of the invitee. 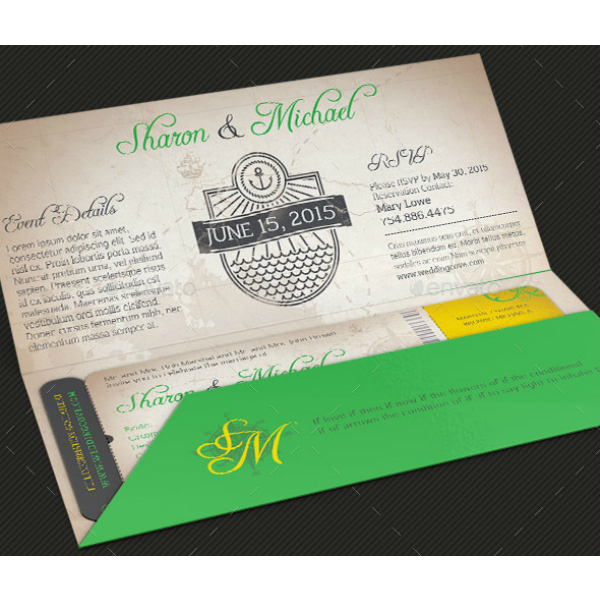 You may also see printable wedding invitations. When you travel via an airplane, the first thing that you will need to do is to book a plane ticket either through the internet, the airline office, or a travel agency. Once you have your plane ticket—also known as a flight itinerary—it doesn’t mean you are already good to go, it only means you have booked a seat on the airplane for that particular flight. On the day of the flight, you will still need to do a few things before being allowed to enter the airplane, the first of which is to have yourself and your bags checked in, although this can also be done online. Even if you only have a carry-on baggage, you will still need to check yourself in to finalize your booking. You may also see free ticket templates. During the check-in process, you will be asked by the airline staff some questions such as number of carry-on and check-in baggage and seat preference (aisle or window). After this process, you are then given the boarding pass which is what entitles the passenger entry to a restricted area in an airport. In some airports, they have a separate booth which requires you to pay a terminal fee. Once you are inside the terminal, you can then wait until the airline starts boarding passengers. Once they do, you will then be asked by another airline personnel to present your boarding pass before being allowed to enter the airline. You can also see ticket templates. What Is Written on a Boarding Pass? Boarding passes contain various information regarding the passenger’s flight, from the sample schedule of the departure to their area inside the airplane. Below are some of the most common details you can see written on a boarding pass, though you may expect to see more or less depending on the airline company. PNR Reference. PNR stands for Passenger Name Record, which is unique for every passenger. A PNR reference consists of a six-character alphanumeric code. 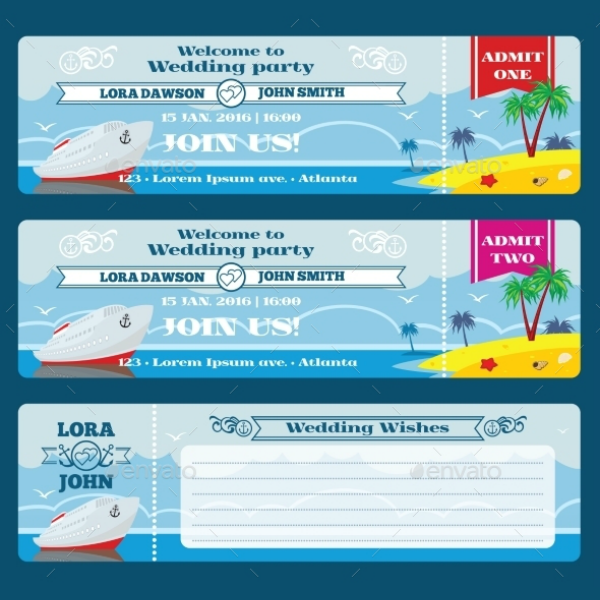 You can also see boarding pass invitation templates. Sequence. A number that indicates the order in which you checked in to your flight. For example, if you are the second person to ever check in to that flight, your sequence number would be 002. 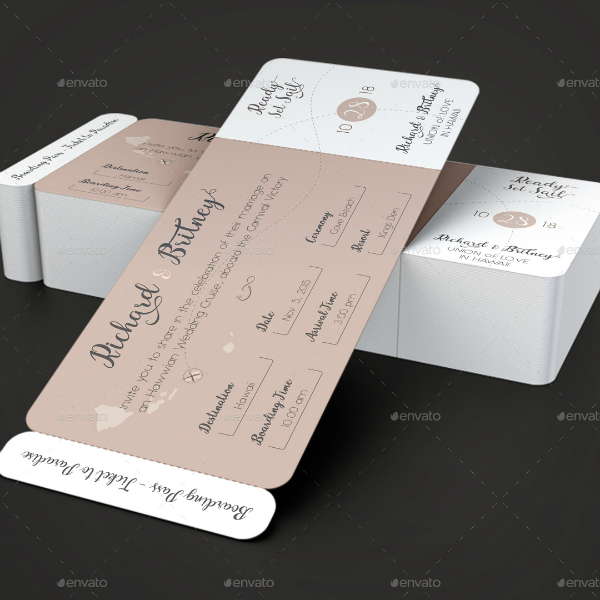 You may also like dinner ticket templates. Boarding Door. A commonly neglected code on the boarding pass is the boarding door, it tells the passenger whether they should board the plane from the back or the front. SSSS. This stands for Secondary Security Screening Selection, which basically means you’re one of the few passengers being selected to undergo a few extra checks. The SSSS picks out passengers by random, and this is usually caused by red flags. You may also see luncheon ticket templates. Planning a wedding may become very tedious, with some doing their initial planning as early as a year prior to the wedding date. There are so much to consider when planning a wedding, which is quite understandable since weddings only come once for most couples, and this already excludes the renewal of vows. Every single detail about the wedding should turn out as perfect as necessary, which is basically the reason why the planning stage really takes time. But how do you actually plan a wedding? Yes, you want to get married, but how prepared are you both mentally and emotionally? Just because you’re already engaged, it doesn’t always mean you are actually prepared to tie the knot with your partner regardless of how much you love them. The first and foremost thing you need to do before planning a wedding is getting yourself psychologically prepared because once you are, you’ll have the drive and motivation you need to plan your wedding properly. 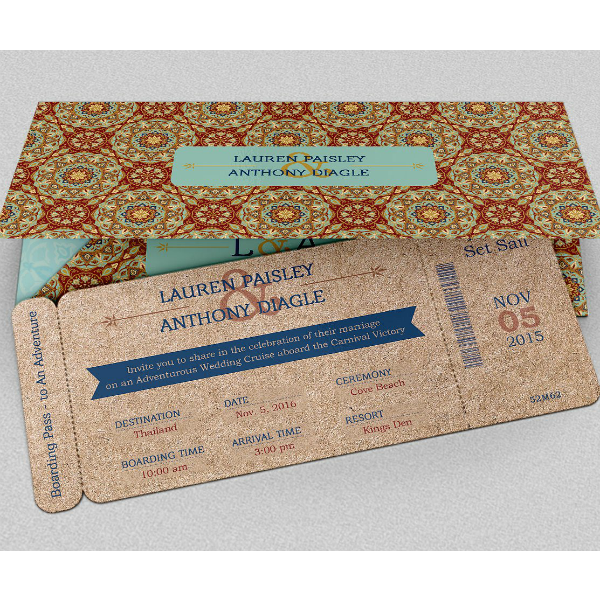 You can also read wedding party invitations. Decide on how much you and your partner are willing to spend for your wedding. To make things more flexible, don’t stick to an absolute amount, you should always plan your budget according to range. Your budget plan should have a minimum and maximum amount, because this will allow you to adjust your expenses easily. The level of extravagance that you want to put on your wedding will greatly depend on your planned budget. Depending on the budget that you and your partner have planned, work with them with regards to the listing of guests as well. Decide first on how many people you two are planning to invite, and determine how many people should be invited from each side of the family. 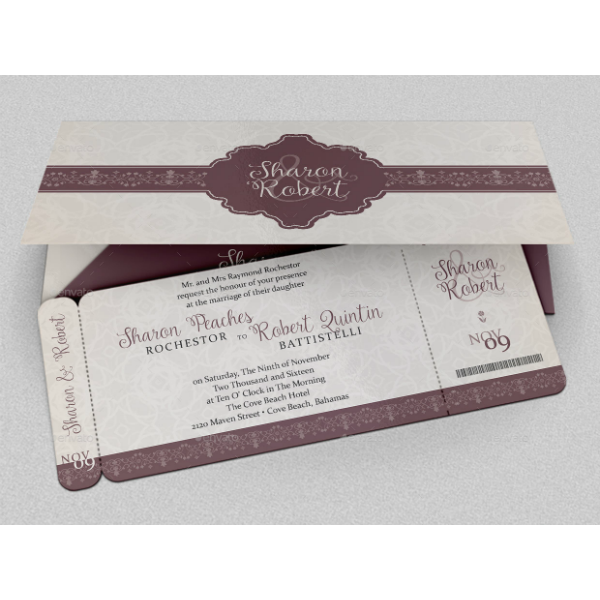 The guest list will also prove very useful once you start working on sending out elegant wedding invitations. During the planning stage, you can’t always remember everything if you simply keep it inside your head even if you allow your partner to think with you, the human mind is fallible whether we like it or not. The best thing you can do to avoid forgetting any detail is by writing a to-do list. Make sure your to-do list is written in an organized fashion, meaning there should be a timeline on when you should do a particular thing, and you should also know how to prioritize the things that need to be done. Plan carefully the date of the wedding, are you planning it for the next year? Or within the next twelve months? It’s up to you and your partner whichever is convenient. But then again, this will still depend on the availability of the venue for both the ceremony and the reception, which will be discussed further below. According to surveys, the most preferred months to hold a wedding are from June to October, while the least preferred is within the winter season, specifically from December to March. You may also see blank ticket templates. This may seem like an easy thing to decide on, but you need to do it as early as possible especially if your planning to hold your wedding within the peak months (June, August, September, October) because the venues may quickly get fully booked. Always have multiple options for you venue if in case one isn’t available, you can easily move on to the next one. And make sure to give your invitees a heads up, especially those who are from different towns or countries, to give them enough time to prepare. You can also see printable tickets.